Crystal Palace manager Ian Holloway gritted his teeth, kept his temper in check and conceded Premier League referees have an impossible job. Holloway has only just started a two-match touchline ban, in addition to receiving an £18,000 fine for an eruption after the opening-day loss to Tottenham, so he wisely opted to keep his counsel after watching his side reduced to 10 men in a 2-0 loss to ManchesterUnited at Old Trafford. 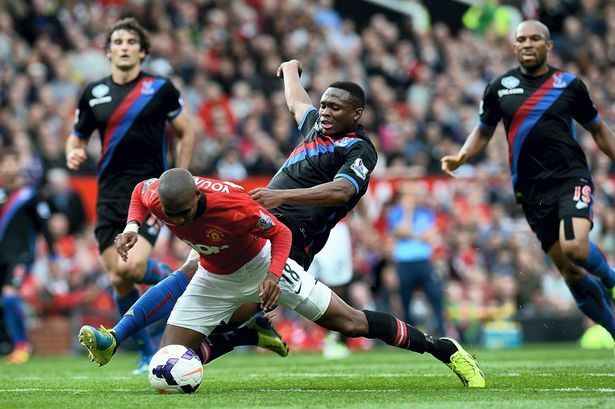 Referee Jon Moss opted to dismiss Kagisho Dikgacoi for bundling down Ashley Youngjust before the break. The foul itself was a debatable call. That TV replays showed the first contact took place outside the box and there were defenders around to cover merely compounded Holloway’s woe. “It is a weird feeling being up in the crowd and see how partisan their fans are,” said Holloway. “They were shouting for everything. “They were shouting for stuff before we even kicked off. If you are in the middle and you have that whistle, it is very hard. There were some who argued Young had dived anyway, which would have warranted a second yellow card for the Manchester United winger given he had already been booked after looking for a penalty after initiating contact with Dikgacoi earlier in the half. “I don’t talk about other people’s players,” said Holloway. The clear inference is not much, a view shared by Moyes, who reinforced his view of diving after the game. “I don’t want my players diving,” he said. Moyes said he would speak to Young about his conduct, which if a half-time conversation with Phil Neville during last season’s Merseyside derby is any guide will not be pretty. Neville, who followed Moyes to Old Trafford from Goodison Park in the summer, was given a “rollicking” by his boss for a dive that earned him a booking. And Moyes also spoke about the curse in discussing Luis Suarez last season. “I don’t think there are many players out there who really do it,” he said.